Since my childhood days I have loved watching the Olympics. I still remember in 1968 as a 12 year old watching the Mexico City Olympics when John Carlos and Tommie Smith raised their black-gloved fists high in the air as a symbolic gesture to make the world aware of racial discrimination in America. The next day I went to Madison Junior High School wearing all black and a black glove on my right hand going down the halls yelling "Freedom for the Blacks! Freedom for All!" Long story short, I was suspended from school that day and my Dad was not a happy camper with my actions. Maybe my actions were misguided and "Junior High-ish" but the spirit behind them was the passion in my heart for Freedom and legitimate Civil Rights for all. Go Chick fil a! As I watched the opening of the 2012 London Olympics I was excited to see much of England where I did undergraduate work at University of Brighton, and London where I received my Ph.D. and where many of my dear friends reside. As I was enjoying the English scenery and the ceremonies unfold I began to notice a political theme creep into a glorious athletic event. Yes there were images of cultural and musical icons as diverse as the Beatles and Mr. Bean to Mary Poppins and Madonna but it was the British Multicultural Lefty Socialism that grabbed my attention and frustrated my heart. At first I thought, "OK Jake relax, your Conservative Christian worldview and values are causing you to see things that are not there." I took mental notes on the NHS(British National Health Service) and CND (Campaign for Nuclear Disarmament) signs and messages in the ceremonies and tried to focus on the ultimate purpose of the Olympics, the Athletes. But the next day when I heard Labour Party MP Paul Flynn proudly declare that "wonderfully progressive socialist sentiments and ideas were smuggled into the opening romp" through the "the eloquent messages of Danny Boyle on NHS, CND, and war futility" and when another member of the British Left-wing Labour Party Carl Sargent boasted that the London Olympics opening ceremonies were "the best Labour party political broadcast I have seen in a while" I knew my disgust over politicizing the Olympics were bonafide and justified. 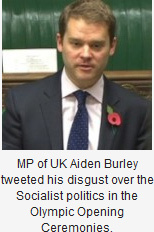 Conservative MP Aiden Burley shared my sentiments when he tweeted "The most leftie opening ceremony I have ever seen — more than Beijing, the capital of a communist state! Welfare tribute next?" And "Thank God the athletes have arrived! Now we can move on from leftie multicultural crap. Bring back red arrows (sic), Shakespeare and the Stones!" "The thing I loved was the heavy political stuff. I loved the emergence of the urban proletariat and the rise of the chimneys and the forging of the ring"
My disgust at British Socialists was renewed. London's Mayor needs a history lesson down the dark corridors of the mad Marxist machinery that in its path destroys life and liberty. What may appear to be a benign and tolerant statement of British history by London's Mayor is a sad failure to recognize that when Karl Marx wrote his diabolical book The Communist Manifesto in London, England in 1848 he unleashed a vile army of "urban proletariat" demons that were not only responsible for the death of over 100 million people in the twentieth century but whose proletariat philosophy still haunt mankind with the specter of Communism, Socialism, Collectivism, Progressivism and Big Government-ism from the English Labour Party to Barack Obama's Democratic Party. 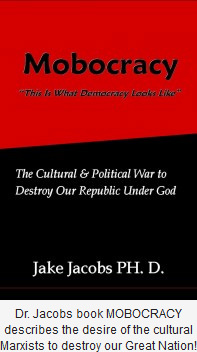 The Cultural and Political War to Destroy our Republic under God. 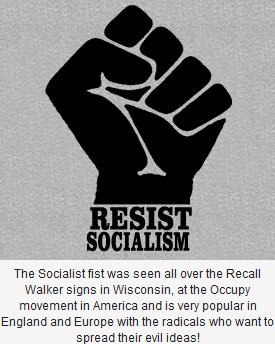 The sub-title points to the clever way the underground and above ground academic and cultural Marxists, Fabian Socialists, and Progressives have permeated American Judeo-Christian culture with "progressive socialist sentiments and ideas." For the past one hundred years they have been grinding us down to the point where it is bone upon bone battling over what direction we will walk in the future. From Fabian influence in American Universities to the 1935 Communist International Popular Front that called for the building of progressive coalitions of various institutions from political parties, labor unions, university professors, musicians, artists, intellectuals they have infiltrated our Christian constitutional culture with Marxist values that are destroying our Republic under God. Sadly they are well on there way to succeeding as many Americans have turned soft and lazy relying on the collective for security rather than individual responsibility. Far too many Americans lack the discipline it takes to work hard and to study the historical origin of America's greatness. They are being progressively influenced by a politically correct entertainment and educational culture that is coupled with cheap sound bites and slogans that promises hope, change and free stuff from crib to crypt. Unlike Nazis and militants Marxists you don't have to burn classic books to destroy a culture just get people to stop reading them unless of course it's Harry Potter, Twilight or Hunter Games. God forbid Americans actually read, study and know about our Founders, the Declaration of Independence, the Constitution, the Federalist and Anti-Federalists Papers. The mantra of the Fabian, Gramcian, Frankfurt, and Alinsky Marxists from the get go has been "let us grasp the weapon of culture and destroy the British and America God centric Judeo-Christian Culture and preplace it with government man centric Marxism." That is why 93-year-old folk singing icon Pete Seeger who would often declare "songs are weapons" sang songs with Woody Guthrie praising the Marxist mass murderer Joseph Stalin in 1940, joined the Communist Party in 1942 and campaigns today with Bruce Springsteen, Crosby, Stills, and Nash, Jackson Brown, Jesse Jackson, Susan Sarandon, Michael Moore, Sean Penn, Matt Damon, Rage Against the Machine and a myriad of other cultural and political court jesters from the Left for the Socialist Occupy Movement and Barack Obama's Re-election Campaign. Many Americans know the song God Bless America (who can forget on 9/11/2001 when both Democrats and Republicans sang that song on the steps of the Capital or when Kate Smith use to sing it over and over again during WWII) but few know that is was hated by many socialists like Pete Seeger and Woody Guthrie who back in the day made the song This Land is Your Land their replacement for a song they despised. As Woody would play his songs he would proudly display on his guitar the slogan "This Machine Kills Fascists." A fascist to Woody, Pete and the bohemian Marxists of yesterday and today is anyone who embraces our Founding Father's Judeo Christian constitutional republican worldview and values. That is why to this day Pete Seeger and many other cultural and political icons in British and American society flock together singing the same tunes of this is what democracy looks like, redistribution of wealth, social justice, national health care, government must solve our problems and "I want my Obama money!" In contrast to the selfish demands of the Left, I am beaming with pride as America's Fab Five won the Team USA Gold medal in girl's gymnastics and Michael Phelps established the amazing all time medal wins in Olympic history. I suppose like American entrepreneurs Obama will try to take credit for their success too. I am also profoundly concerned that far too many Americans and Europeans have either embraced the Fabian socialist "Labour party opening ceremony's political broadcast" or are foolishly duped into accepting "the urban proletariat.... progressive socialist sentiments and ideas that were smuggled into the opening" ceremonies. As I watched our wonderful American teenage Fab Five with tears in their eyes, hands on their hearts and hope in their future I prayed that the God in whom we Trust would illuminate our understanding that He governs in the affairs of men and that without Him we perish. In Election Year 2012 let us fight for the future of America's Fab Five and all of our children by telling the Fabians in Congress and the White House we are on to you and we want you out of our children's future, starting January 20, 2013. Now go get involved to turn our Republic back to its constitutional roots!